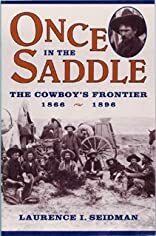 Using a wide variety of primary sources, describes the life and work of the nineteenth-century cowboy, who became such a popular folk hero that his influence is still felt in American life. About Laurence Ivan Seidman (Author) : Laurence Ivan Seidman is a published author of young adult books. Some of the published credits of Laurence Ivan Seidman include Once in the Saddle: The Cowboy's Frontier, 1866-1896.